There’s one thing I always know when I start reading a KB Ritchie book: I’m going to fall in love with the characters. All of them, main characters or side characters, strong or silent, outspoken or timid. No one does character development like Krista and Becca Ritchie. Infini tells us the story of Luka and Baylee, two performers who work for the same aerial company. The two were friends when they were teens, and they were in love. But harsh circumstances ripped them apart and still keep them apart in the present. The company wants to revamp one of their current shows and Luka finds himself working with Baylee once again. What follows is an emotional and angsty journey between two people who never really got over each other. 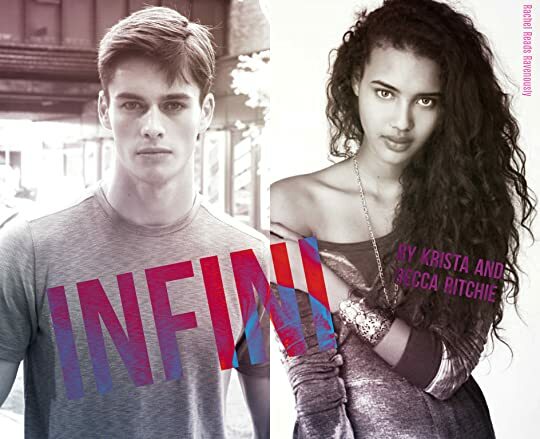 Infini is a book I have been dying to read, and it can be read as a standalone but I encourage you to read Amour Amour, if only to meet and get to know some of the characters. Amour Amour is a story that touched hearts and told the reader to follow their dreams. 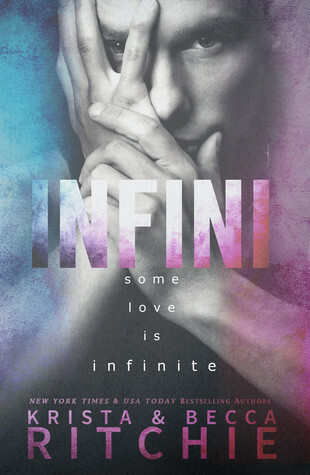 Infini to me is about not losing hope and to never give up on love. Baylee and Luka invoked the rawest emotions in me, I found myself at times either holding my breath or exhaling with relief while I was reading. And for my angst junkies out there like me, BUY THIS BOOK! Those of you who don’t love angst? Everything that caused the angst was not unnecessary and was not added to the book solely to manufacture drama. It all makes sense, it all fits together and the characters and their actions will not frustrate you. I PROMISE. Side characters, I almost always address this when I review a KB Ritchie book but I will again. I LOVE THEM!!!! We don’t get disposable one dimensional characters, nuh uh. We get believable and lovable and relatable and flawed AND wonderful side characters. They make the story so real and I find myself always wanting to know more about them. They add to the main characters and refine the world building in the books. Obviously I want to see more of ALL OF THEM. But for now can we pretty please have a Katya book? And a Sergei? And a Dimitri? AND a Timo/John?? You callin me greedy? NEVER. I teared up near the end, my eyes burned with emotion for these characters. Luka makes an amazing hero and Baylee a stunning heroine. I would gladly read more about them and the world they live in any day of the week.